Does anyone deal with VRR dropping/turning off on the windows desktop? I notice this because I usually have the gsync notifier turned on and I confirm it with the monitors OSD. I'll play a game with VRR enabled and then quit back to desktop and after a while VRR is not longer functioning until windows is restarted. theangryregulator wrote: Does anyone deal with VRR dropping/turning off on the windows desktop? I notice this because I usually have the gsync notifier turned on and I confirm it with the monitors OSD. I'll play a game with VRR enabled and then quit back to desktop and after a while VRR is not longer functioning until windows is restarted. Hm, never had that issue with a regular gsync monitor. Must be a bug with the nvidia driver on non-gsync VRR displays. Well, I've read this whole thread and have tried to keep. The tech talk here goes a little over my head. I'm certainly no longer in the market for a 240hz as my computer couldn't even consider frame rates that high. So I'm looking at xg2402 and it looks great but i'm seeing it is Free sync. Not G sync. I have an nvidia card. It also doesn't support ULMB or ELMB or light boost? Again I'm confused... I want lowest input lag and no motion blur ideally. 120hz lightboost / ELMB / ULMB? and different people prefer different things. Any more insight would be appreciated! LordGurciullo wrote: Well, I've read this whole thread and have tried to keep. The tech talk here goes a little over my head. If you have a nvidia 10xx series or 20xx you can use gsync on xg2402 and it works perfectly without any flicker. Xg2402 response times are amazing, so is the input lag! I have a gtx 770. I know.. It's old. Also, This monitor doesn't have ULMB or any form of motion blur right? Hello Notty_PT man im really impressed you've been through the pains a lot and learn so much i will greatly appreciated if help a bit. and amd freesync a.m.d. optimized but i play on full hd,almost everything on low and medium are ViewSonic XG2402 144hz will be better choice i mostly play Battlefield 4 and Destiny 2 for change on future i hope World War 3. I'm only registered for this site, because maybe you can help me. I neverd tried 144hz or 240Hz (had a 14 year old LG FULL HD monitor 60Hz), but I feel as you are totally right with the 240Hz thing. I wanna buy now a new monitor, but reading after days can not know what is the best options. My first point was 240Hz , but after I read your "Why I'm done with 240hz" now is 144hz. I want to use the new monitor only for competitive FPS games (primary : fortnite) . My setup : RTX 2060, Ryzen 5 2600x, 3000Mhz G.SKILL RAM. What do you think which are the best 144hz monitors now ? / * good colors are important us for me / G Sync need or good idea for competitive FPS ? Hypnotic wrote: Hello Notty_PT man im really impressed you've been through the pains a lot and learn so much i will greatly appreciated if help a bit. Hi there! TO be honest if you already have a freesync 144hz monitor it isn´t worth it to "sidegrade" to another model, even if that model (ViewSonic XG2402) is better (faster on both input lag and pixel response time). Unless you are an enthusiast and want to try it out, no need to in my opinion! You already have a legit model! gabethomas wrote: Dear Notty_PT ! Hi there! I would advise you to still try 240hz if you can, because we are all different and you might like it. Altho, if you want to go 144hz route and you can´t buy ViewSonic you have LG 24GM79-B, for example, wich is a great 144hz TN model! This is quite true, I see lots of people pleased with upgrading from 144Hz to 240Hz. Not everybody is picky about the same things. Look at all those Amazon star ratings of people who bought 240Hz after 144Hz and they're still raving. Just like those people who hate tearing, but others don't care. -- Tearing on 240Hz is less visible than tearing on 144Hz. Even for 144fps at 240Hz VSYNC OFF. -- I know some are more bothered by phantom array effects, and using 240Hz really helps with that. 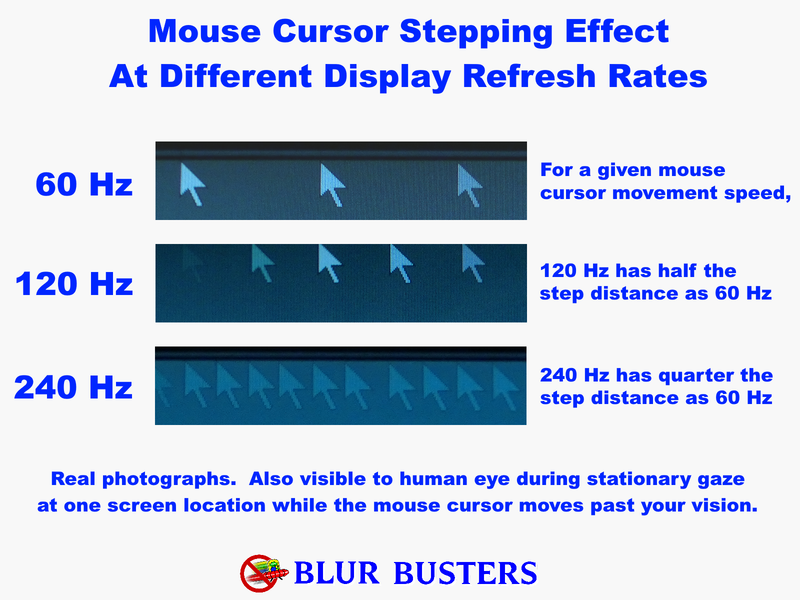 -- If you get eyestrain from motion blur, 240Hz can even be ergonomic to your eyes even at Desktop. Depends on the person. Some people _really_ _really_ _really_ hate those kinds of stroboscopics, and going ultra-Hz is the only way to reduce that kind of artifact. Ghosting differences of mid-framerates (e.g. 144fps at 240Hz) is not even noticed by everyone if they're immediately bothered by something else bigger to them. Mind you, everyone is different, and 240Hz isn't always a perfect superset of 144Hz in the upgrade department. As Notty_PT clearly is. We can't fault those who find fault with 240Hz but we can't deny that many people are pleased with their 144Hz->240Hz upgrade.